If you’ve been on a distillery tour, chances are that you’ve seen or been inside a dunnage warehouse. Some people believe that dunnage-matured whiskies are ‘better’, but is there any justification for this view? The Whisky Professor investigates. Like all good questions, yours raises a number of inter-connected issues. As you may be aware, the creation of spirit ‘character’ relies on many factors, from the production processes used at the distillery in question to the type of cask employed for maturation. In the grand scheme of things, the type of warehouse in which the whisky is aged may be a relatively minor factor, but it is a factor nonetheless. I should say from the outset that I will confine my comments mainly to the type of warehouse building used; the impact of the geographical location of that warehouse – whether high in a Speyside brae or close to a storm-lashed Islay shore – will have to be a subject for another day. 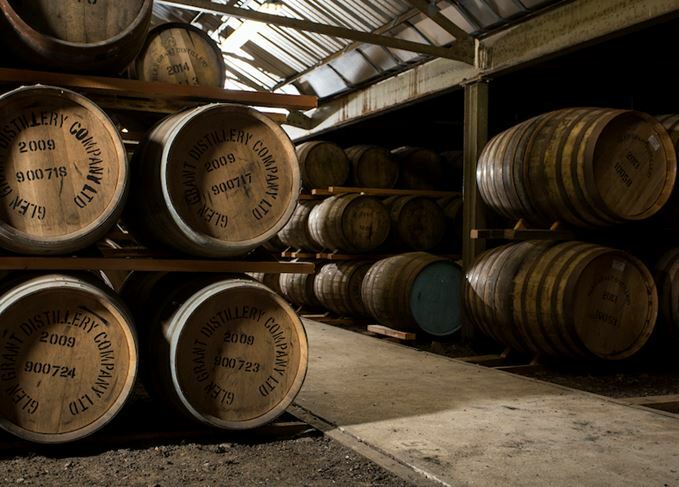 Broadly speaking, the Scotch whisky industry uses three types of warehouse: the traditional dunnage, of which you speak; the more modern ‘racked’ type; and, bringing things entirely up to date, the ‘palletised’ warehouse. These have evolved in line with the expansion of Scotch whisky production: where once a few dunnage warehouses adjacent to distilleries sufficed, now there are vast parks of large-scale warehouses in Scotland’s Central Belt. The classic dunnage warehouse is, as you describe, a low and often windowless building with thick stone (sometimes brick) walls and a slate-and-timber roof. Inside, casks are usually stacked in rows known as ‘stows’, two- or three-high; sometimes there may be more than one storey, with wooden floors dividing the levels. There’s no damp course, and the floor is typically earth or cinders, meaning that humidity is relatively high, influenced as it is by the condition of the surrounding soil and the water table. The thick walls and low stature make for a relatively cool and even temperature throughout the day, week, month and year. However, dunnage warehouses are expensive to run, since they store a relatively small number of casks per square metre, and since moving casks – a necessarily manual task – is labour-intensive. Now for racked and palletised warehouses. Dating from the 1950s, racked warehouses stack casks on their sides, eight or 12 high on steel racks and in long, parallel rows. Meanwhile, palletised warehouses store casks on their ends, on – as the name suggests – pallets, up to eight high. Both of these systems are efficient, enabling large numbers of casks to be stored in one place, with forklift trucks able to move casks around with relative ease. An accountant’s dream, compared to the unwieldy dunnage. More modern warehouses are generally built of brick, cement blocks or steel, with concrete floors and insulated aluminium or asbestos roofs. This large roof area and (compared to older dunnage warehouses) poorer insulation makes for a much greater degree of temperature variation in racked or palletised warehouses, between the highest and lowest rows of casks. It’s nothing compared to the conditions experienced by maturing Bourbon in Kentucky – where, in summer, the top floors of warehouses might reach 50-60C, versus 18-21C at the bottom – but, in Scotland, the highest casks in a racked warehouse might hit 20C in summer, compared to 12-15C at the bottom. Humidity will also reduce as you go higher in a racked or palletised warehouse, especially as the temperature rises. What does all of this mean for the maturing spirit? I speak in generalities, but conditions in a dunnage warehouse or at the bottom of a racked or palletised warehouse are likely to be fairly similar: stable, relatively low temperatures and relatively high humidity. This promotes increased evaporative losses of ethanol, rather than water, leading to a gradual reduction in alcoholic strength. Move to the upper levels of a racked or palletised warehouse and the picture changes. Here, temperatures will be higher, leading to greater evaporative losses for both water and ethanol; but, at the same time, lower humidity translates into greater evaporative losses for water, rather than ethanol. Theoretically, in the same warehouse and over time, a cask at the bottom could reduce in alcoholic strength, while one at the top could increase. This will gradually change as you ascend (or descend) the racks and pallets. The role of ventilation is harder to assess; while the rate of evaporation will be impacted by the airflow around the cask, multiple factors – from how sheltered the warehouse is to how often its doors are opened – can have an effect. Dunnage warehouses tend to have good air circulation, compared to the somewhat crowded conditions of their racked and palletised equivalents. I am wary of describing the impact of all of this on spirit quality, since ‘quality’ is a notoriously nebulous and subjective concept; we can, however, talk a little about spirit ‘character’. In terms of the chemistry, higher temperatures lead to increased rates of extraction, reaction and diffusion; studies suggest that, in the top tiers of larger racked or palletised warehouses, this can result in a darker spirit, with a higher level of non-volatile elements. In addition, the bigger changes in temperature at higher levels impact the pressure levels inside the cask, making the spirit volume contract and expand, which – it is thought – increases the amount of interaction between liquid and wood. Further studies have suggested that grain spirit matured at higher temperatures tends to be sweeter, but less ‘clean’; while that aged in cooler conditions was described as smoother and more pleasant. Meanwhile, investigations in Japan have identified notable differences in the effect of maturation conditions: spirit matured on the top tier of warehouses was said to have more phenolic compounds and esters, prompting descriptors such as ‘woody’, ‘vanilla’ and ‘fruity/estery’; that aged at the bottom was described as more ‘green/grassy’, ‘cereal’ and even ‘feinty’. There are numerous caveats to add before we close. Seasonal, monthly and even daily variations in the prevalent maturation conditions can have an impact on all of the above – but, having said that, Scotland’s temperate climate is such that mean temperatures and humidity levels are relatively uniform. It’s also true to say that a full warehouse of whisky is to some extent self-insulating, such that it will take quite a dramatic change in outside conditions before the large volume of spirit contained in casks inside the warehouse is heavily affected. Warehouse construction varies: some more modern dunnage warehouses have thinner walls and modern roofing materials, while some racked warehouses retain earth floors under the racks to promote humidity. All of this can impact maturation conditions. Lastly, there is the human factor. Unless they are looking to make a single cask whisky or a very limited-edition bottling, the master blender or distiller will be combining numerous different casks to create the final expression, ironing out such subtle variations as they may find along the way. If necessary, they can also move casks around during their maturation period, so that they experience different conditions. It may very well be that, as you heard, distillery X is keeping ‘the good stuff’ in a dunnage warehouse; but the impact of the conditions inside that warehouse on the whisky’s inherent quality is open to question. What is certain is that no warehouse – whether dunnage, racked or palletised, and whatever its internal conditions – can rescue a badly-made whisky, or one that has been filled into a poor-quality cask. A short question, but a long answer; I hope it helps.